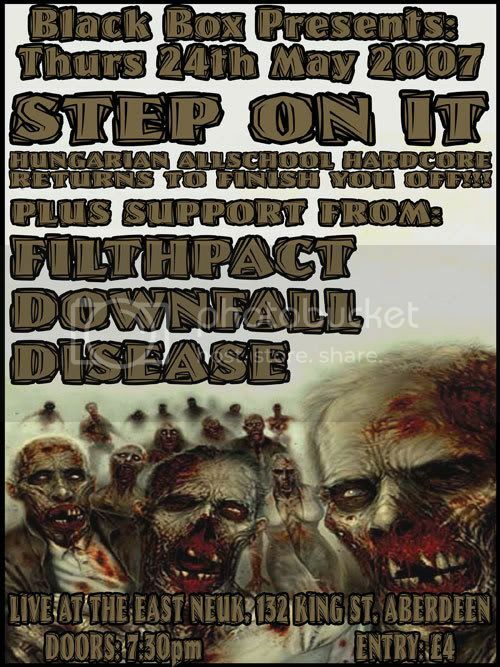 Step On It - Hungarian Thrashcore returns to finish you off! Filthpact - Free Speech for the Dumb. Disease - Brutal Jazz Grind. Downfall - Metalic Thrash think Sepultura/Slayer mixed with Fear Factory. Live at the East Neuk 132, King St, Aberdeen. Step On It were brilliant the last time! Very energetic! Woo! Well looking forward to it..
As am I. There is much drinking to be done for cheap in the Star! Be cool to play Montrose actually. Only ever been there to deliver meat to various burger-vans, bakers & Glaxo. Gigs in The Star a regular thing? I am looking forward to the Montrose leg with a huge amount of relish. Yas min! Just started recently.Put PVH on when they last toured and that was the first. Used to use a church hall but as with a lot of these things folk just wrecked the place and now no more gigs there. Sounds like Elgin... at least you have an alternative now though. I'm pretty sure the rest of Bonesaw would be up for a wee trek down to Montrose if ye wanna put us on sometime. Filthpact/Step On It 7" available at this gig!